There must be a thousand restaurants in Tokyo like the Izakaya-Tomotsu near the train station in the Chiyoda-Ku ward: eight stools lined up at an L-shaped counter; and outdoors, two rickety tables with beer crates for chairs. This rough-and-tumble yakitori parlor serves up every imaginable cut of grilled chicken, from the leg, wing, neck, and skin to the liver, gizzard, heart—and a great deal more. All this comes from a closet-size kitchen dominated by a charcoal grill barely the width of a single skewer. But the real treasure here is the pot of tare (yakitori sauce) that has been simmering uninterrupted and building flavor for years. At its most authentic, yakitori consists of grilled chicken, plain and simple, without the fireworks of rubs or marinades. The grill it’s cooked on measures about two feet long and just a couple of inches across—the ideal size for cooking tiny kebabs without burning the exposed part of the bamboo skewers. (A hibachi like this one works great, too.) When asked about the charcoal fire, the owner of Izakaya-Tamotsu explained in about the only English words he knew that it burned in excess of 1000 degrees F.
The first dip takes place halfway through the grilling and serves to glaze the mixture onto the meat. The second dip coats the meat like a sauce. The process lacquers the chicken with a glaze that is sweet, salty, silky textured, and absolutely irresistible. The master sauce, usually ignored in American versions of yakitori, is what distinguishes a great yakitori parlor from an ordinary one. 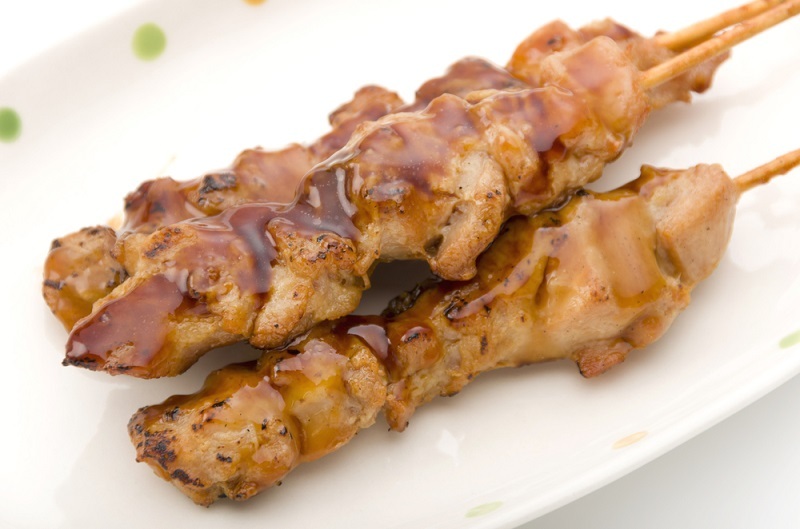 For like the master sauce of China, the tare is used over and over, acquiring more flavor with each dipped grilled chicken skewer (the sauce is replenished at the end of each grill session). It’s not uncommon in Japan to find sauces that are months or years old, with a concentrated flavor that will bowl you over. So how do the Japanese address the food safety issue? Well, for one, Japanese chickens are raised in much more hygienic conditions than ours—you can even order chicken sashimi (raw chicken) in Japan. And because the yakitori is dipped halfway through the grilling process and again at the end, the sauce is never cross-contaminated with raw chicken. 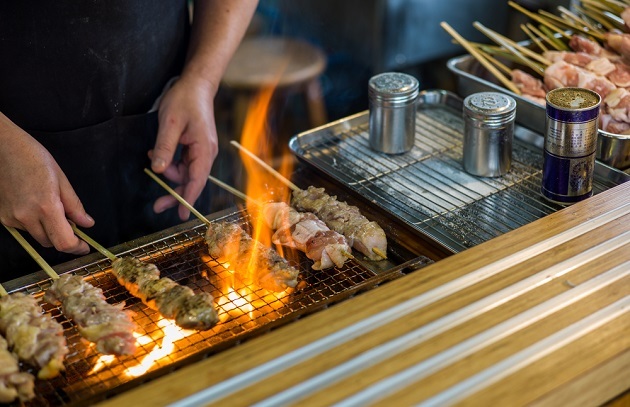 But just to play it safe, when making yakitori in the United States, I recommend keeping the sauce hot on the grill and boiling it well after each use. Want to try Yakitori Like They Make It in Japan? Click here for the recipe. Click here for more information on how to grill yakitori.